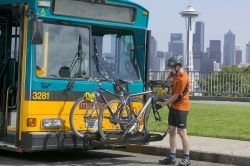 The company that has brought the world the most popular bus bike rack ever is at it again. Introducing the Sportworks two-bike VeloPorter2 and three-bike VeloPorter3. Reduced maintenance costs due to replaceable parts. Lighter weight, making the racks easier to install. High corrosion resistant finish for longer rack life. Backwards compatibility, providing transit authorities a more cost-effective upgrade. VeloPorter2 holds two bikes, VeloPorter3 carries three bikes. "The Sportworks VeloPorter2 and VeloPorter3 have been years in the making," says Lisa Falvy, Vice-President of Multi-Modal Products for Sportworks. "We've been listening to our clients and incorporating their feedback into our new designs. The VeloPorter series is the result." The VeloPorter2 and VeloPorter3 will be available Fall 2006.